When you take on the large task of applying to college, a part you’re likely to dread most is writing an essay. Why? Because it can be so hard to get started! But, we can help. Most of you will be asked to write an essay about your community service experiences, and most of you already know that other applicants have had experiences similar to yours. So, how do you make yourself stand out? First, plan in advance, and check out Baylor University’s excellent guide to help you organize and focus your thoughts. Also, take a look at our earlier post about avoiding common pitfalls. Then, when you’re ready to write, consider these useful tips to help you write a stellar community service essay. If a professional writer reviewed the first draft of your essay, he or she might cross out the first couple of paragraphs and instruct you to turn the middle into the beginning. That’s because a great way to hook your reader is to start in the middle of the action. Remember, your readers are reviewing hundreds – maybe thousands – of other community service essays. Perk them up by grabbing their attention from the get-go. Get rid of most of your background information, especially if it’s covered in your resume already. Select a poignant moment, and go from there. A community service essay is your chance to let your readers get to know the real you – not the “you” that your teachers see in your term papers. It’s okay to use “I” statements, to thread in some humor, and to share your personal reflections. Be genuine, and let your voice set the tone. Make sure to complement the bullet points of your resume with anecdotal stories that show your values. By the end of your essay, your readers should have a clear understanding of how your passions led you to choose such an activity, and how it helped you grow. The heart of your community service essay should show how you developed. Personal growth might be experienced because of the team you worked with, or the mistake you made that taught you a valuable lesson. It’s okay to show your readers a bit of humility. Dig deep and consider how your perspective evolved as a result of your experience. Show readers how your routines or priorities changed after you completed your service. Remember, community service is all about making a difference, so be sure to demonstrate how you and your team made an impact on a worthy cause. When you end your essay, you want to leave your readers thinking about your experience hours later, or even days later. A good way to achieve this is by finishing with some thoughts or questions that your experience prompted. You can indicate how you answered these questions, or explain how you’re still considering them. If you have ideas of how to continue serving the same cause, suggest ways you might accomplish this while a student at their school. Don’t be shy about pointing out a resource or initiative that the school has already in place, and explain how you could contribute to it. This will show your readers that you are genuinely committed to advancing the common good. When you finish, leave your essay alone for at least 24 hours, and then return to it to proofread. This will allow you to read it with fresh eyes and ears. Ask a trustworthy family member or teacher to read it and give you feedback. After you proofread it several more times, you’re ready to submit! The MobileServe app makes it easy to track and measure your social impact and offers service resumes for college and job applications. The app is free to download! Find it on the App Store, Google Play, or on MobileServe.com! 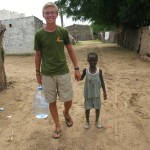 Roderick traveled with us on our high school summer community service program in Senegal in 2011. A current senior at Camden High School in Camden, South Carolina, he will be attending Wofford College in the fall. The essay below, about building bricks during his volunteer experience in Africa, was part of the stellar application. Congratulations, Roderick! complicated process, but it is a process where the efforts of many reaped tremendous rewards. Driving to a hardware store to buy a brick was not an option, but to create just one brick took a considerable amount of time. I soon discovered that laying a foundation for a home was more than just a repetitive and laborious process… it was a catalyst for my future. I was in another world– one without running water or electricity. One without plumbing. One without a bed. One where speaking my native language was not the norm and accomplishing the most simple daily tasks often took hours. I arrived in Mbissel, a small village in Senegal, West Africa– four thousand miles from my comfort zone and not a soul I knew. I soon discovered that living in this foreign world was far less complicated than living in my world. In fact, it was much simpler: less hectic and full of meaningful experiences. Making bricks step by step, one by one may be mundane, but the friendships I made, the smiles I received, and the relationships I built while creating thousands of bricks were more fulfilling than anything I had experienced in my 16 years. worked with the villagers. They were my teachers, and as I worked alongside them, they became my friends. My daily lesson was simple but time consuming: hauling sand and concrete, walking the 30 minute roundtrip hike to the well for water, mixing the water and the concrete, pouring the mixture into a mold, carrying the mold to a field to dry, walking back, and starting again. It was a process so simple, yet so painstakingly slow. How could such a tedious job yield such gratifying emotions? Enjoying the ripened fruit of the mango tree was the perfect ending to my day; this setting became another classroom where I taught and was taught in return. The children of the village flocked to any “toubab” that they spotted, so I was obviously never alone under the mango tree. As I reflected on the day’s work, the children constantly begged for attention, which I freely gave. They attempted broken English while I mutilated the beautiful French language. It didn’t matter what we were trying to say, for hand gestures and laughter were the result of our efforts. My attempts to count in French made the Senegalese children laugh as I could only count to 40, and they would continue on to 100. Out of curiosity, we taught each other. My experience in Senegal was the beginning of my foundation. I believe that learning takes place not only in a classroom, but along the paths I have chosen to take. The lessons I learned while making bricks and sitting around the mango tree continue to resonate within me. Respect for citizens of the world, other cultures and an appreciation for values taught and learned in new environments will be my foundation. I built bricks for the Senegalese, but they have built so much more for me. I look forward to pursuing the journey, brick by brick.